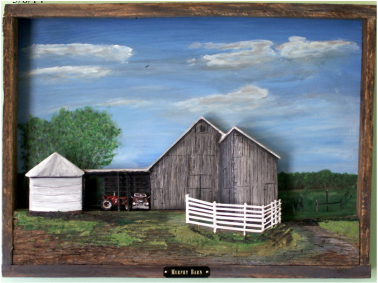 Dorrel Harrison is an Indiana Artisan who creates three-dimensional images from reclaimed wood. 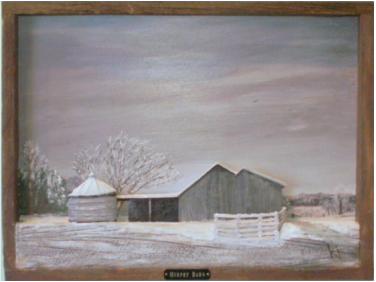 The Bicentennial Barns of Indiana project was conceived out of his interest in sharing his craft and the beauty of barns with others while, at the same time, recording these proud structures through his art. Dorrel hopes to “collect” images of barns for posterity. He enlisted a group of volunteers who share a passion for barns and wish to do the same. Dorrel, who was designated an Indiana Artisan in 2008, currently resides in Scottsburg, Indiana. He travels the state to photograph barns, mills, churches, store fronts, and other structures. He then interprets that photo into a three dimensional image. You can visit a permanent exhibit of his work at the Mid America Science Park, 821 South Lake Road South, Scottsburg, IN 47170. Learn more about Dorrel and his work at his website, www.barnmillplaques.com. What is an Indiana Artisan? Learn more about this program at www.indianaartisan.org.